This is a picture of the washer off my 2011 JAWA Classic (please ignore the state of my jeans which form the backdrop). 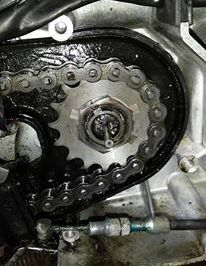 You tighten the centre nut then select where to bend it forward against a nut “flat”. Benefits include being able to position this for use many times as you work round the washer circumference. Avoid reusing the section already used – in this case at 2 o’clock on the washer. Here is the previous style washer I used and you can see the tangs, 2 of which have been bent against the nut. Look closely at these earlier parts. The washer has the same 6 tangs but the ends are pre-bent making it an easier job to fit. The centre nut is also a work of art having cut-outs for easy and secure locking. 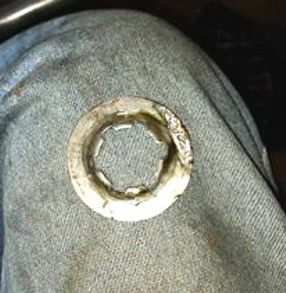 This early nut and washer fits straight onto the JAWA Classic, indicating the end of that shaft has not changed in 60 years.